Remember when I said I’m going to finish these by the end of March? Hahaha…I’m sorry. 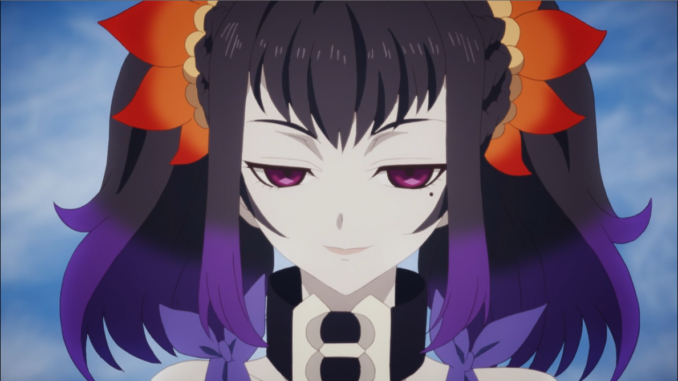 Let’s have a moment of silence for the death of one of Zestiria’s important items: iris gems. 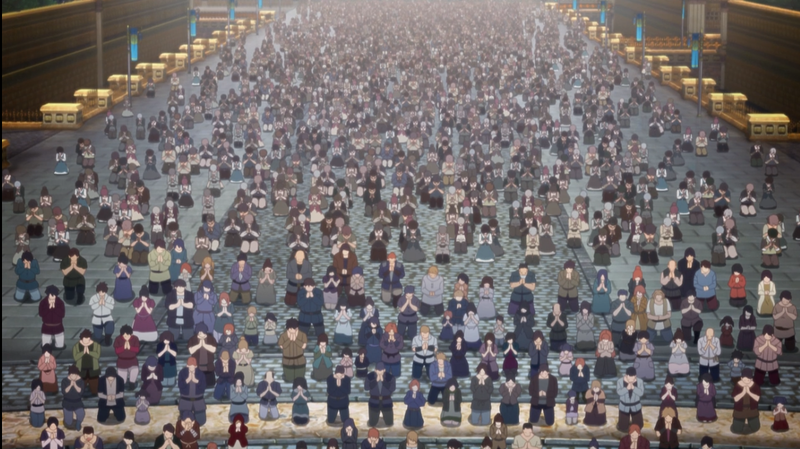 Episode 21 starts off with the citizens of Ladylake praying for Alisha to wake up. 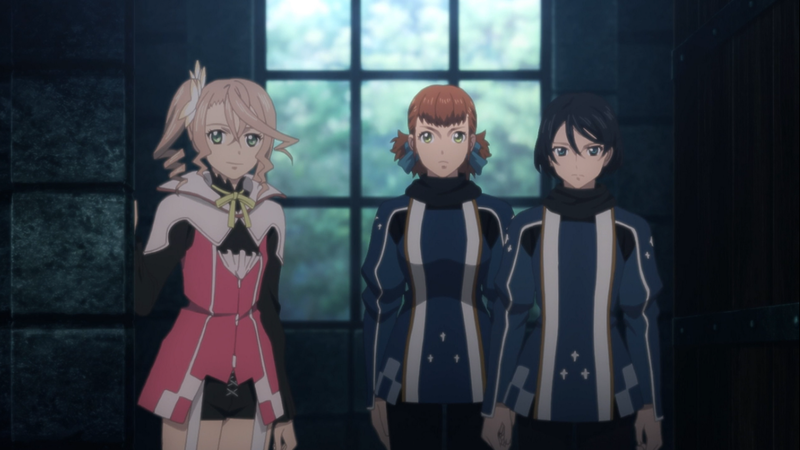 Mikleo, Edna and Lailah are surprised to see how much the city cares about Alisha. It’s been at least 9 days since the Shepherd and his two squires passed out. Sorey’s been in bed for five days, so he came out after being tired in bed. Alisha and Rose are finally awake after the ninth and current day. Honestly, there isn’t that much to talk about for these two episodes. Rather than talking about significant happenings, I’m going to talk about what I want to talk about for these two episodes, which are mainly the characters, some aspects I like in these two episodes, and other miscellaneous things. 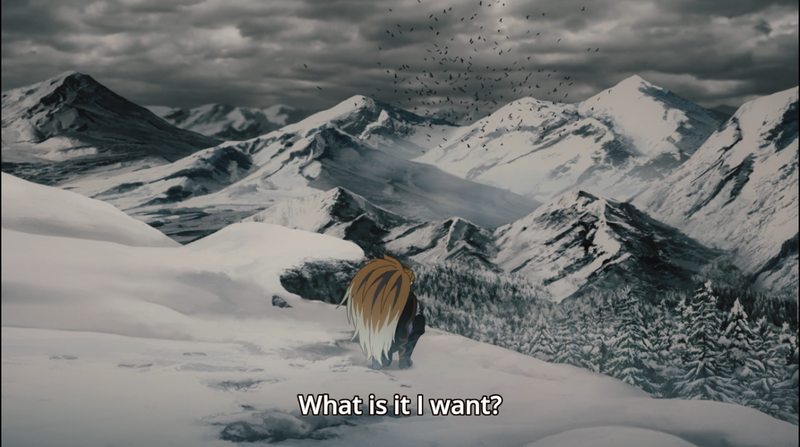 If I were to summarize these two episodes: Episode 21 and the first half of episode 22 are the calm before the storm and then the latter half of episode 22 is the storm that plunders the peacefulness. I guess I’ll start off with the peaceful aspects of this episode. 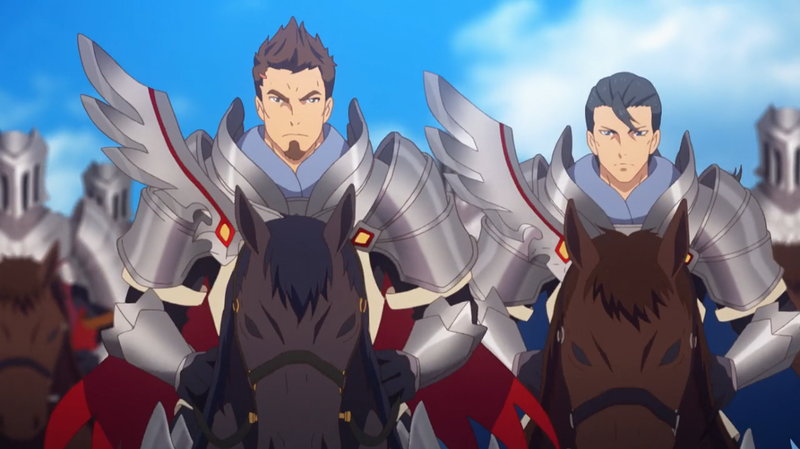 Episode 21 was just a calm episode with little action and basically the part in Tales games and other RPGs where characters talk before the big battle brewing ahead. I honestly like it. 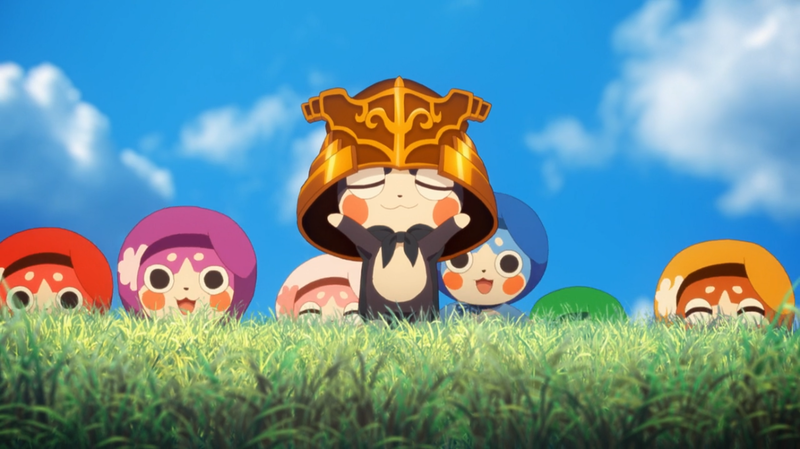 I love the serene picnic scene that is similar to the ending of season 1 (the same song is also used as background music). 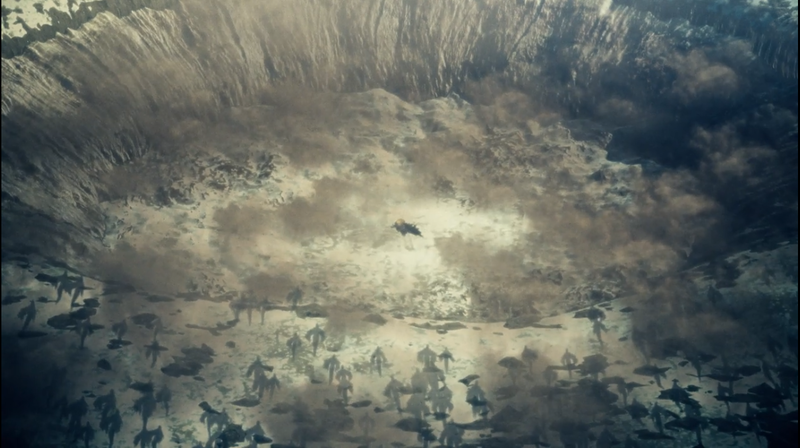 The first half of episode 22 is also peaceful with the way the group is still traversing through Northgand. The action starts in the latter half of the episode which is a good transition. Also, I do love that each character shines a bit in this episode. I’ll start off with the NPCs. The important side characters come together and help Sorey on his quest to defeat the Lord of Calamity. 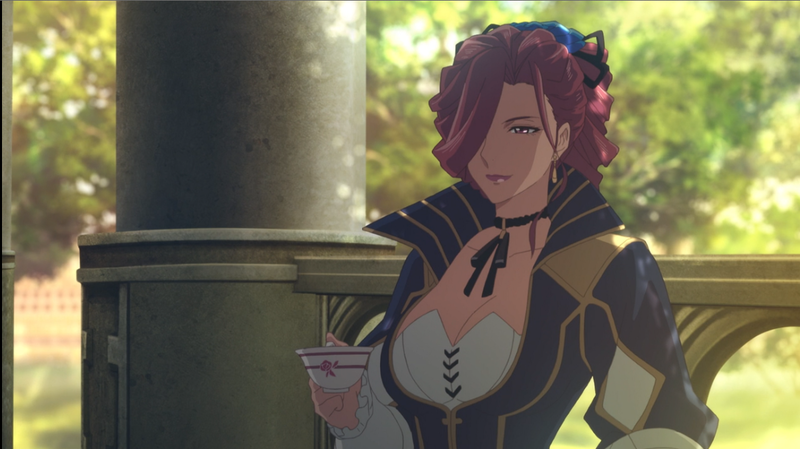 Before we get to the important NPCs, I want to talk about the minor characters like Hyland’s civilians and the people who joined Sorey In the game, there were people who liked Alisha, but many were never seen supporting her like in the anime. I’m glad that Alisha has people who love her a lot compared to the lonely girl she was in the game. I do like how it’s because of the tornado incident that people finally become aware of the Shepherd and such. In the game, there were characters that thought Sorey becoming a Shepherd was a ploy to get attention or to instigate conflict (I don’t remember much, but I did know that there were some rumors in the game universe about the Shepherd being fake). I’m glad that the little detail about the ‘fake’ Shepherd in the game is removed. It was a bit tedious because it doesn’t get brought up again after part 2. 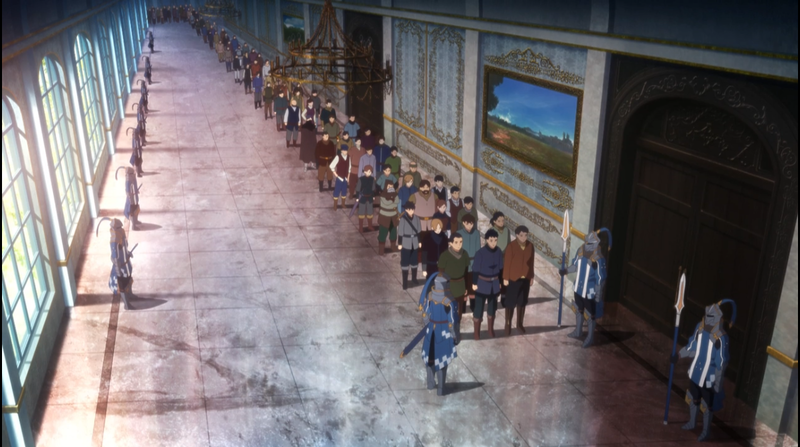 The amount of people wanting to join the army to help Sorey. Okay, now for the major NPCs. First off, I want to say that Ian is so cute, especially when she’s hugging Alisha’s lap. Both Sirel and Ian—although anime original characters—happen to be two of my favorite minor characters in this anime. I don’t know why, but they’re just so fun to watch despite them being Alisha’s lackeys most of the time. I do like how Ian shows off her cooking skills and makes a pumpkin mousse that Mikleo is enamored with. Maltran… I’m guessing they’re officially not going with the hellion route. It’s good. Alisha already suffered enough. Though, the line she said about Alisha being the next in line for the throne kind of irked me. 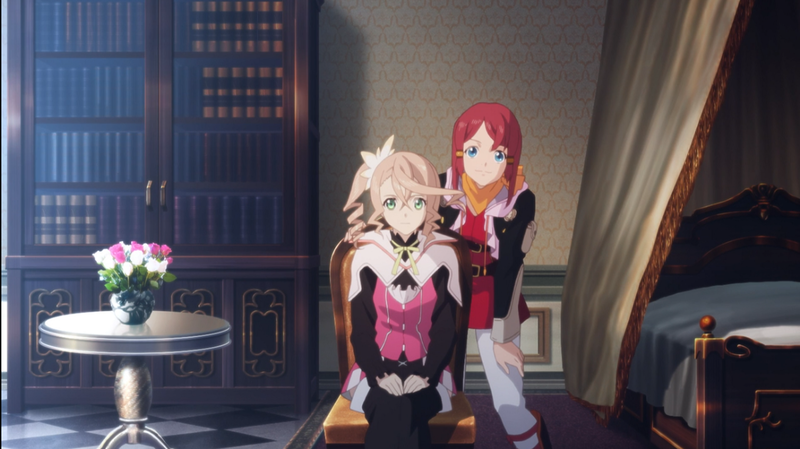 In my previous review, I went on about Alisha’s family—or rather, whether or not she has one due to her father being the only one present in the anime. Also, Sergei and Gouldman…wait a minute, wasn’t Gouldman’s armor different in previous episodes or was that just my imagination? I think he wore blue to emphasize his status as a Blue Storm Knight. Why is he wearing the Platinum Knights armor? Is it a standard to wear that armor in Rolance? Hm… Though, I do like how Rolance is going to help Sorey despite having been in war with each other. It shows that the people are friendly and willing to side with the enemy. Normins! I do love how Atakk and Mikleo still keep their friendship in this episode. I do love how Atakk shows off the normin power boost in episode 22 when he enhances Mikleo’s attack to help fight off the dragons. Normins should help out more. Lunarre…I still don’t know what his role is in the story. I could care less, honestly. I just don’t like him. 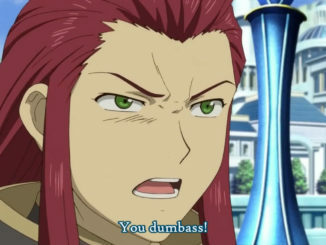 I guess Ufotable got the gist of that too and just suddenly killed him towards the end of Episode 22. He wants to do something good, but he doesn’t really show up to do that in the anime. It feels like a last minute sympathy call just to appease Lunarre fans. I do like the focus on Symonne for these two episodes. Her actions were enigmatic, but she doesn’t seem hostile. I do love how her ability to create illusions and to multiply herself is still canon in the anime. I do wonder what element she is though, since there are only five: non-elemental, fire, water, earth and wind. I do like how her loyalty towards Heldalf is still present even back during season 1. Though, I wonder if her being doubtful towards her master’s actions is a bit sudden. Although, her becoming a dragon was a bit random, but I guess it fits with the action due to the amount of dragons in Northgand. Heldalf still gets no development and is only there to be the villain of the story. 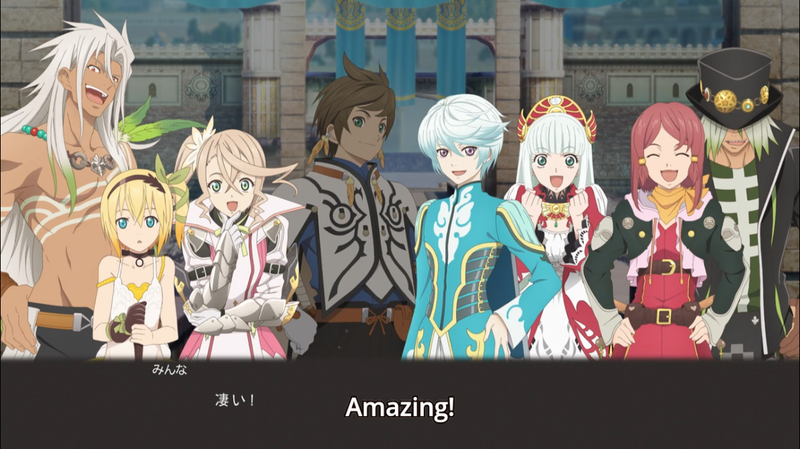 Though, I do like how Symonne shows Sorey and friends about his motives. He plans to end the world by gathering a lot of Malevolence and then unleashing it to create a Zestiria-style apocalypse. Heldalf in the middle of a hole. 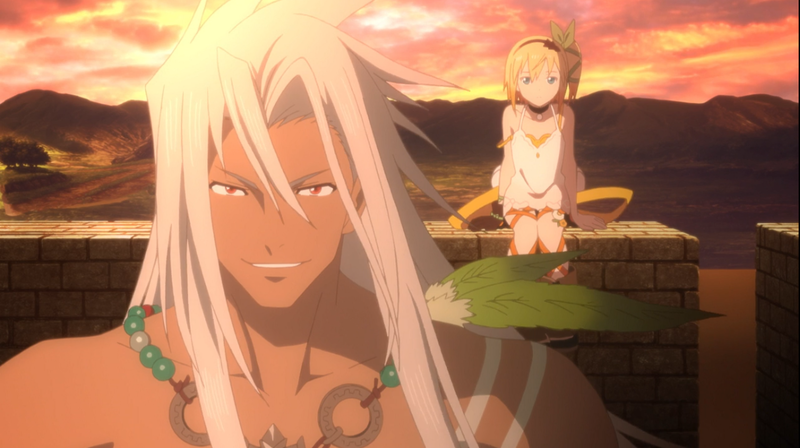 Zaveid gets a bit of focus too. He tags along with Sorey and helps the group fight the dragons by shooting them or creating a barrier to protect the other humans from taking in the Malevolence. I’m sure he’ll get more focus in the next episodes. Zaveid finally joins the party. 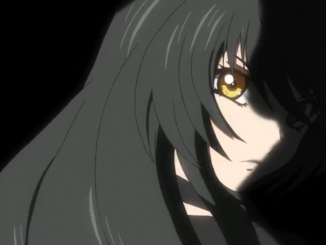 Dezel, on the other hand, gets a lot of focus in this episode. He was rather brooding in the game, but here, he’s more collected and cautious. His soft side when it comes to Rose is also shown. He tried to fight Symonne to get answers on Heldalf’s motives, carefully helped out the group with talks of the squires obtaining the armatus, planned out which seraph should armatize with Alisha, and then helped Rose with her focus to master the armatus. He does a lot of things and it kind of worries me because it seems like they’re focusing a lot on him. I have a feeling he’s going to die. 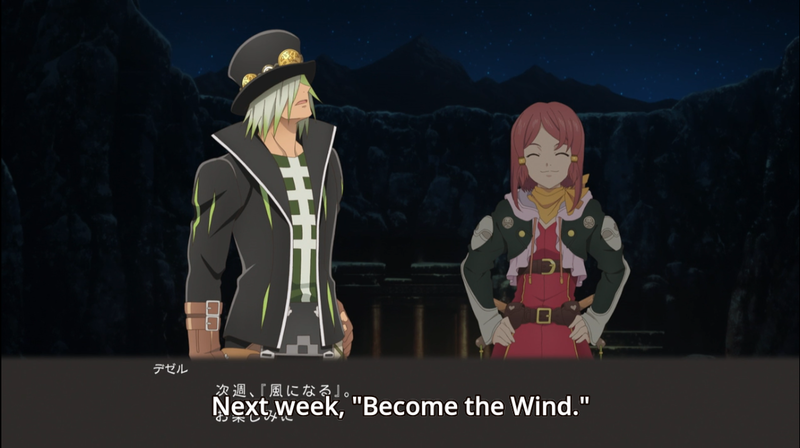 The next episode’s title is even called “Become the Wind.” Although I do not have much of an opinion on Dezel, I was on the verge of tears when he died in the game. I’m not going to say much of it due to spoilers (and that I’m most likely going to talk about it in the next review), but I’m going to say that it’s…bittersweet, yet still satisfying at the same time. He died with a smile and with the intention to save and protect Rose, which has been his motive from the moment he showed up (other than his desire to get revenge on Symonne). Also, his true name is revealed in this episode. Lukeim Yurlin means “Dezel with Unclouded Eyes”. I don't think this ever gets mentioned again, but this sounds so out of context. Edna gets some focus, but it’s important focus. First off, Sorey passes through Rayfalke because saving the world comes first. 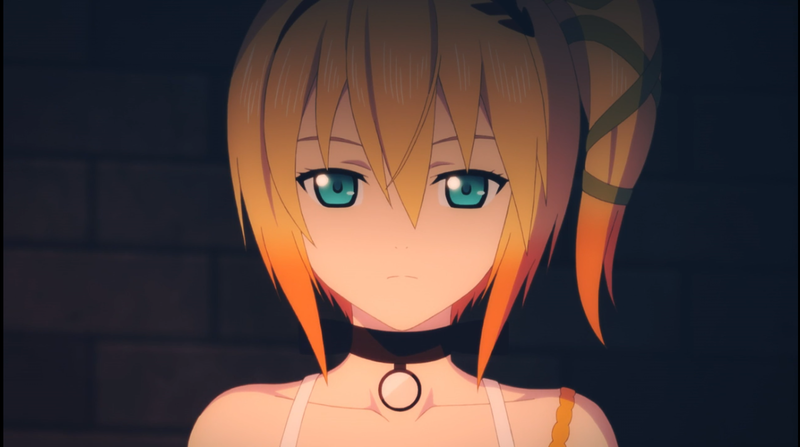 I’m a bit sad that Eizen is getting shafted, but if the world ends, then he can’t get purified and then Edna won’t be there to see him. I hope they’ll at least show the purification in the ending credits of the final episode. Edna and Eizen (mostly Eizen) deserve to be happy. I also like Edna’s snarky personality is still shown (mostly in episode 21). Her interaction with Alisha was mainly the highlight of her focus. Edna isn’t really familiar with Alisha, but she doesn’t hate her. I do like that she’s slowly warming up to her in these two episodes. They’re alike in a sense. They both want to protect and save the things they care about: Eizen for Edna and Hyland for Alisha. Edna looks really pretty in this shot, so I had to get a good screencap of it. Mikleo is shown not to be Sorey’s yes-man in these two episodes. He does have his caring side shown towards Alisha for he’s worried about her; he can tell from observation about how much strain dragon purification takes on a human. He also bickers with Sorey for a bit with his newfound love for pumpkin mousse. He gets some action with Atakk who boosts his attack stats and is able to fight dragons now. It’s been a long road. Back in season 1, he couldn’t do much fighting because he wasn’t a Sub-lord yet and he had to use the Divine Bow to damage hellions. Meebo’s developed a lot. Lailah’s still Lailah. She serves as exposition. I do like how her cautious side is shown when Dezel suggests giving the squires the armatus. I always wondered why she’s quick to reject ideas when they never tried it; I know she speaks from experience, but since Sorey purified a dragon, a feat considered impossible, I was sure she would be more lenient. I’m positive she’s just trying her best to not make Sorey become the second Michael. Lailah looks really pretty in this shot. Rose has more action in these two episodes. 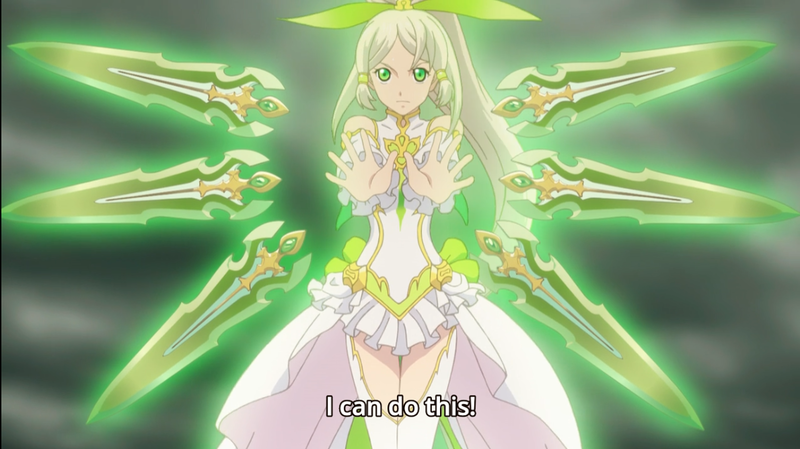 She gains the armatus and becomes a key component to the group. I do love how Rose tells Mikleo about her and Alisha’s role, with her being the rash one and Alisha being the rational one. I think it fits them. It shows that even though they are foils, they still work well together. The little fashion show she had with Sorey was cute too. She’s back to the friendly merchant Rose. Rash Rose and Rational Alisha. Alisha accompanies Sorey on his quest to defeat Heldalf. 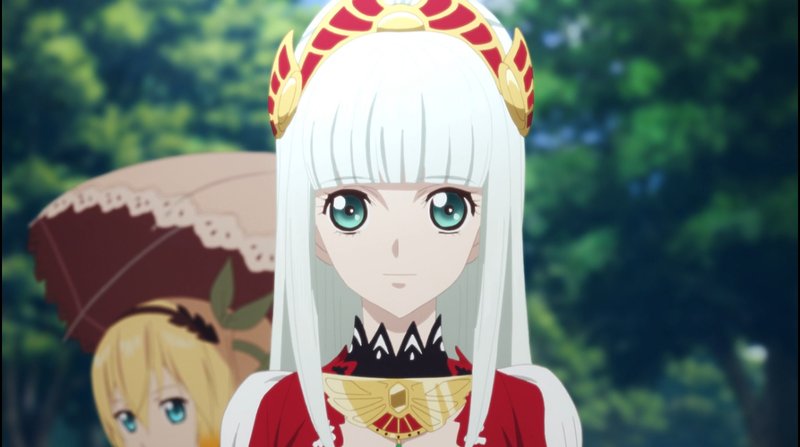 She knows that she should stay in Hyland as its princess, but going with Sorey is the better option because if the world is destroyed, there won’t be a Hyland for her to protect. I think this is a good reason for her to join and that it doesn’t seem forced. She also gains the armatus and I am satisfied with how it looks and how she’s being more useful. Yet, I am still neutral over Alisha. That will never change. 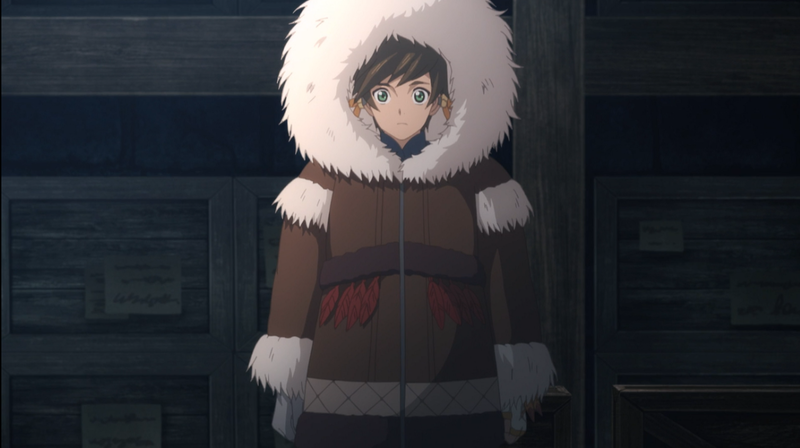 Sorey doesn’t do much in these episodes, unfortunately. He gets Michael’s book and does other little things. I think it’s just a preparation for the bigger action. I do wonder what his opinions of the past events happen to be. Honestly, this was my favorite coat choice. 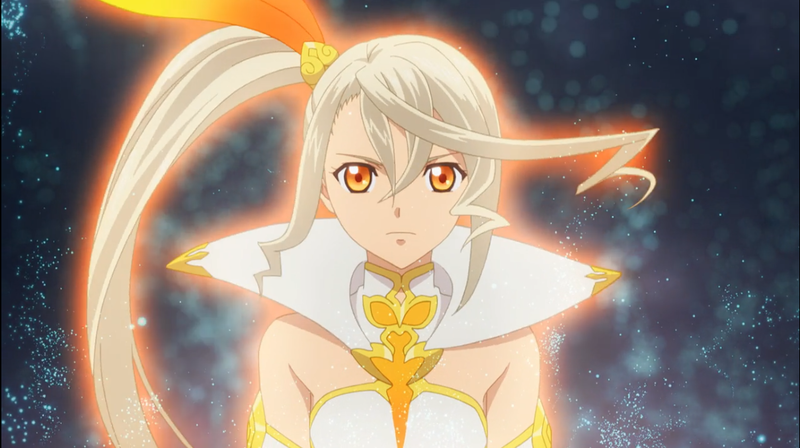 Now, I want to talk about the armatus. 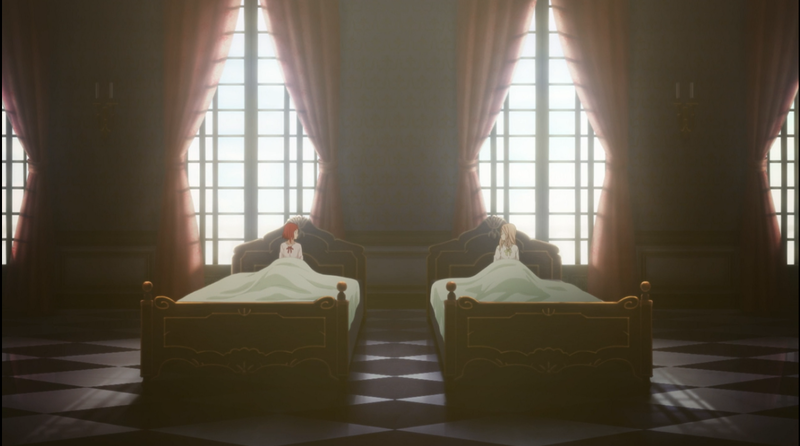 Rose and Alisha acquire the armatus in episode 21 and they fully utilize it in the next episode. I’ve seen people with mixed feelings about that on other websites. 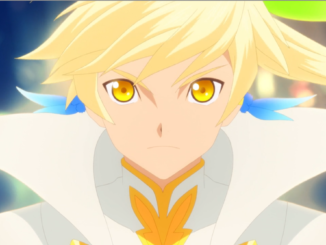 I mean, Sorey is able to do it instantly in Season 1, Episode 3, and his power wasn’t all that strong like Rose and Alisha. I think it does make sense for them to instantly do it on their first try in combat. I love Alisha’s armatus design. It suits her a lot. Also, I do like how she gets the seraph with the best defense. I don’t remember much about Alisha’s defense stats in the game, but she was a hard hitter, so making her a hard hitter with a good defense for the armatus is basically making her overpowered (if squire Alisha was still a thing in the game). Rose gets the wind armatus. I do like how it seems to be her default armatus since she was shown with it first in the opening. Also, the floating knives are a reminiscent to her weapons, so I like that little detail. The last thing I want to talk about is the Celestial Record. Yes, RIP iris gems. Instead of getting a flashback through those gems, Sorey learns through Lailah that Shepherd Michael was the one who wrote the Celestial Record. He also wrote another one in which the details of Velvet are written down alone with pictures (The question is: Did Michael draw them?). Sorey most likely learns of the events of Velvet’s journey and the events that took place afterwards. 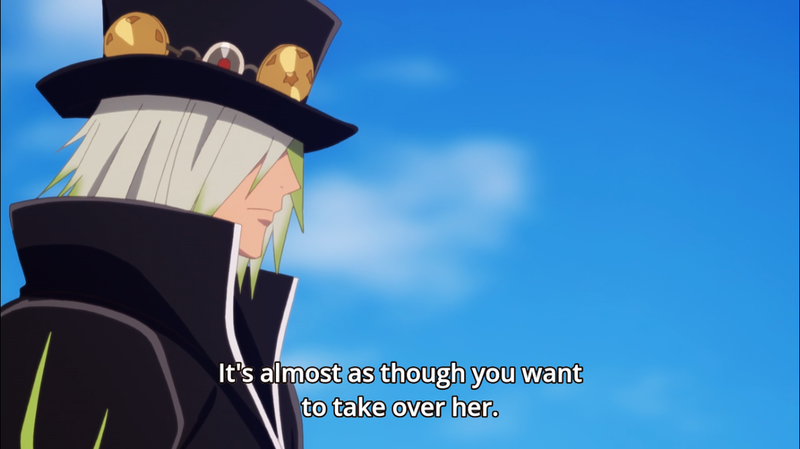 Although I do like iris gems, Lailah giving him another Celestial Record is a good replacement. The iris gems only showed part of the past; with the book, Sorey learns about events further in the past. 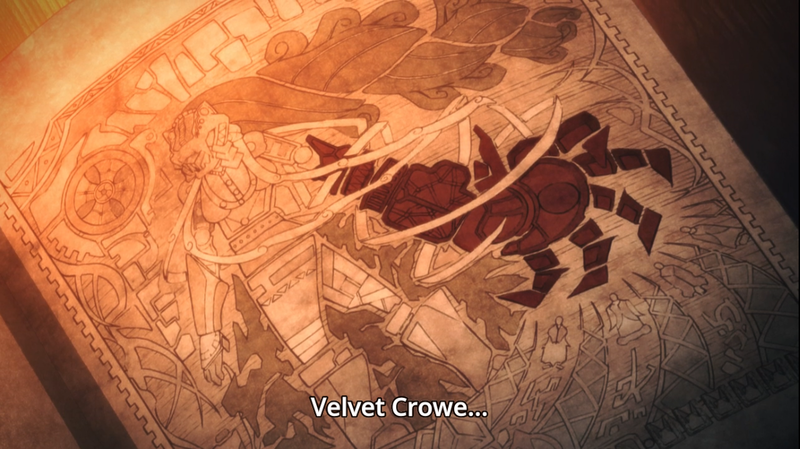 Velvet gets mentioned again, but the exposition given here is the common knowledge most Berseria players know about: Velvet’s anger and Artorius Collbrande sacrificing her brother caused the events in the game. Honestly, nothing interesting happens in these two episodes, and it shows in this review. The only good is that Alisha gets her armatus, but that’s about it. I honestly don’t have much opinion about them. I feel Ufotable rushed a lot with these minor characters seeing how Symonne turns into a dragon and Lunarre gets offed so quickly. I think that the characters are kind of the weaker aspects of this anime. They just show up without being too significant; not to mention, they are also easily forgotten. I almost forgotten Symonne and Lunarre were characters. I want to like these episodes, I really do. It’s hard to do so when I can’t really think of anything to review about. 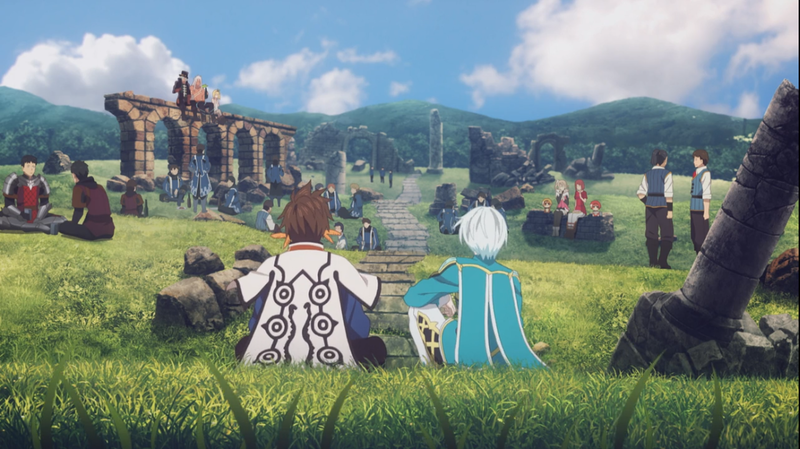 I also like Sorey’s word-end game skills and Dezel and Mikleo talking about Rose and Sorey—I think it’s a good nod to the game where Dezel and Mikleo would have calm conversations in skits. One of the ones I can remember is when Mikleo learns how to do windstepping after a chat with Dezel. Sorey, the word-end game (shiritori) master! I sense a death flag. Anyways, I’ll end this review here. I hope you enjoyed reading this review and I hope you look forward to the next one!